The 2017 convention of the National Federation of the Blind will take place in Orlando, Florida, July 10 to July 15, at the Rosen Shingle Creek Resort, 9939 Universal Boulevard, Orlando, Florida 32819-9357. Make your room reservation as soon as possible with the Shingle Creek staff only. Call (866) 996-6338. The 2017 room rates are singles and doubles, $83; and for triples and quads $89. In addition to the room rates there will be a tax, which at present is 12.5 percent. No charge will be made for children under seventeen in the room with parents as long as no extra bed is requested. The hotel is accepting reservations now. A $95-per-room deposit is required to make a reservation. Fifty percent of the deposit will be refunded if notice is given to the hotel of a reservation cancellation before June 1, 2017. The other 50 percent is not refundable. Rooms will be available on a first-come, first-served basis. Reservations may be made before June 1, 2017, assuming that rooms are still available. After that time the hotel will not hold our room block for the convention. In other words, you should get your reservation in soon. All Rosen Shingle Creek guestrooms feature amenities that include plush Creek Sleeper beds, 40" flat screen TVs, complimentary high-speed internet service, in-room safes, coffee makers, mini-fridges, and hair dryers. Guests can also enjoy a swimming pool, fitness center, and on-site spa. 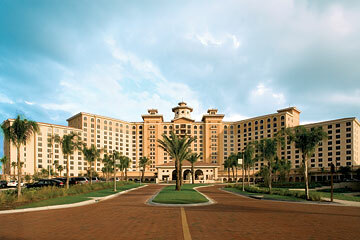 The Rosen Shingle Creek Resort has a number of dining options, including two award-winning restaurants, and twenty-four-hour-a-day room service.